GAST has introduced a new range of vacuum pumps and compressors to its extensive portfolio. These new products are simple in operation, robust and an effective source of compressed air. The three pump and compressor ranges include sixteen oil-free and oil-lubricated rotary vane models and, in a first for the organisation, four claw pump models. Announcing the new ranges, Gast Group’s Andrew Lidington explained that the company has extensive knowledge of the pneumatic industry and its customers’ needs continually drive the development and introduction of new and innovative products. “GAST is already renowned as a world-class manufacturer of vacuum pumps and compressors and these additions to our portfolio will provide customers with products that, compared to our traditional offering, can deliver even greater flow and deeper vacuum. The addition of claw pumps also perfectly complements our portfolio and opens up new industries and sectors that we haven’t been able to participate in previously.” said Lidington. Claw pumps are an often-overlooked technology due to a slightly higher initial cost. However, compared to oil-free rotary vane, claw pumps use significantly less horsepower to provide similar vacuum capability. They also provide 100% duty cycle and, with no carbon vanes and significantly less gear lubricant to replace, are quicker, easier and cheaper to maintain. With only moderate energy consumption and very high efficiency, GAST’s four new claw pump models – PA.155, PA.315, VA.155 and VA.315 – use contactless rotors that are synchronised by gears without any lubrication in the pumping chamber. This frictionless operation avoids any residue (generated by rubbing during rotation) from contaminating the air supply; and means lower maintenance and operating costs, longer lasting performance and improved total cost of ownership. 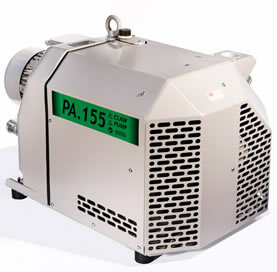 With nominal capacities from 155-250m3/h at 50Hz, vacuum capability to 150mbar(abs) and pressures up to 2bar, the GAST claw pump range is ideal for numerous vacuum, compression, aeration, extraction and drying applications in sectors including printing, environmental, medical, bulk material handling, CNC machining and vacuum hold-down. Adding to an already impressive portfolio of rotary vane pumps, two new oil-free models – SB.16 and SB.40 – being introduced feature an industrial Monobloc design with the rotor assembled directly on the motor shaft. This direct-drive design means fewer moving parts, making these new dry vacuum pumps extremely compact, reliable and easy to maintain. Additionally, a rear centrifugal fan ensures optimal cooling of the pump and each model is equipped with protective filters at the inlet and silencers at the outlet. Both models are also suitable for use as compressors. A third model, the SC.100, has the rotor installed on the shaft and fixed by two bearings, with the motor being connected by a flexible coupling. The fan is installed between the pump housing and motor to ensure optimal cooling; and a robust and compact housing provides protection and keeps noise levels extremely low. GAST’s new oil-free rotary vane models offer nominal capacities from 16-100m3/h at 50Hz. All models provide vacuum in excess of 120mbar(abs) and are suitable for applications including printing, conveying, wood/plastic presses, automated packaging and pick and place operations. 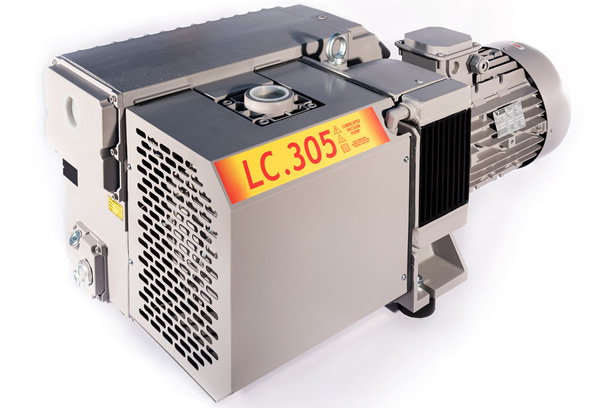 Suitable for applications as diverse as laboratory conditioning/refrigeration appliances, mass spectrometry, packaging, medical equipment, thermoforming machines and glass and marble machining, GAST’s new ten-model range of oil-lubricated rotary vane pumps – including the LB.8, LC.12, LC20, LC.25, LC40, LC60, LC106, LC151, LC.205 and LC.305 – are suitable where the intake flow may require higher flow and deeper vacuum. Additionally, and for applications where intake vapour is considerable, a WR version also features an integral system that separates oil and water condensate, which is then expelled when the pump is stopped. All six oil-lubricated models offer nominal capacities from 8-305m3/h at 50Hz and total final pressures between 2 and 0.1mbar(abs). Summarising, Lidington said that, thanks to their advanced performance, durability and ease of maintenance and serviceability, GAST products are trusted globally to operate in critical applications. “The introduction of these new pumps now provides us with a comprehensive product line, which will allow OEMs to minimise their product development timeline and investment and get to market faster than their competitors.” he added.